With this processor controlled, easy to use device you can make very accurate measurements, by discharging the batteries with the selected constant current. You can check the battery`s starting ability, whether it could start an engine or not. You can also measure the reserve capacity of any battery. You just have to select the required test parameters (current, cut off voltage, time) and start the test. 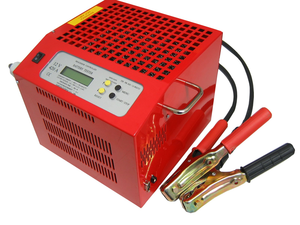 The tester automatically discharges the battery with the selected discharging current until the selected cut �off voltage. After the test it displays the measured Ah value. If you would like to use the device to test a generator, you just have to connect it to the generator, and increase the discharging current while watching the voltage. With this technique it is very easy to measure the max current of any generator.